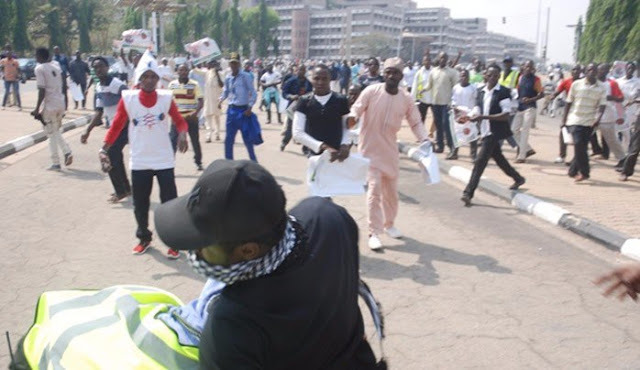 There was pandemonium in Kaduna when members of Islamic Movement in Nigeria, IMN, in their thousands took to the street along Ahmadu Bello Way with placards in a procession as people ran for their safety. Though the reason for their protest is not immediately known, it may,however, not be unconnected with the detention of their leader, Sheikh El Zakzaky and his wife. The immediate intervention of police personnel who engaged them with teargassed reduced tension in the area. As at the time of filing this report, the situation has been brought under control as people are now going about their normal businesses.